Nothing says “summertime” like a good old fashioned pie. I wish that you and I could just sit out on my front porch and share a couple of pieces of yummy goodness together and talk about life. Baking pies used to be a scary thing for me, especially when I first got married. Making the crust just right, having the filling form, getting the crust to brown perfectly with out burning it….it takes some practice. But today I want to share with you, hands down, the EASIEST pie recipe I’ve ever made. It would be the perfect recipe to make if you are just starting out baking pies or feel a bit apprehensive about trying to make one. It would be a great treat to bring to your 4th of July get together next week! I have made my own pie crusts in the past, but to be honest, sometimes the process of making my own takes quite a bit of time and effort with two littles at home. Pillsbury, in my opinion, makes the BEST pre-made pie crust. Just pull it out of the fridge, unroll it (roll it out with a rolling pin a little thinner if you would like), place it in your pie pan and your done. It saves a ton of time and it tastes completely home made! 1. Place pastry shell in pie pan and set aside. 2. In a small bowl, combine flour and sugars; with a pastry cutter, cut in butter until mixture resembles fine crumbs. 3. Sprinkle two-thirds of the mixture into the pastry shell; top with peaches. Sprinkle with remaining crumb mixture. 4. Top with a dusting of cinnamon. 5. 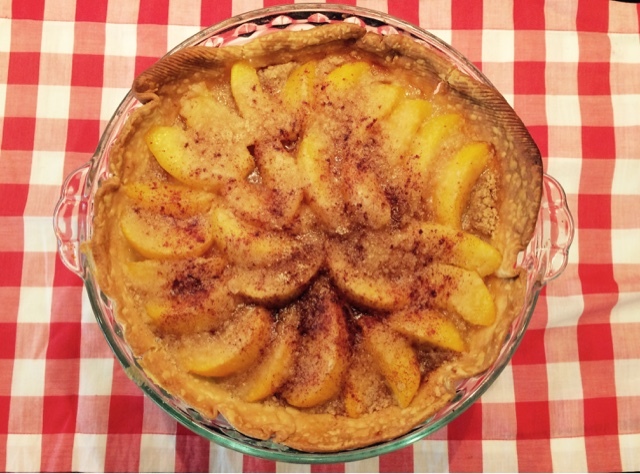 Bake at 375 for 40-45 minutes or until filling is bubbly and peaches are tender. This should yield 6-8 servings. I think this recipe would taste great with sliced apples, pears or mixed berries. I’m sure I will try some of them and let you know how they turn out. Happy baking! yum- excited to try this! !